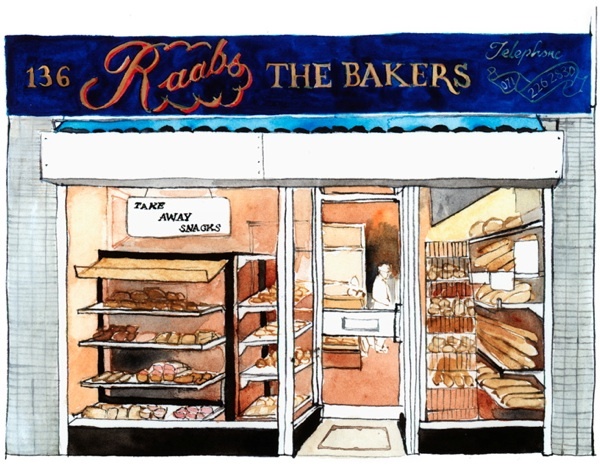 In common with Eleanor, I also plan my routes around the East End using the bakers’ shops as landmarks – so that I can take consolation in knowing the proximity of the nearest one, just in case the desire for something tasty from the bakery overtakes me. 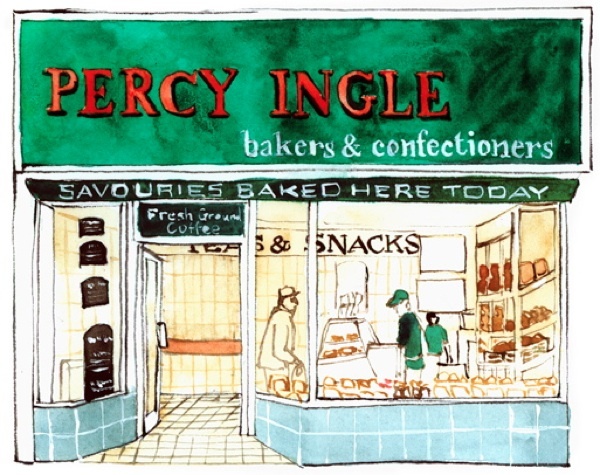 Pleased to see a Percy Ingle on there – they’re a lovely little chain, the bread pudding particularly recommended as a high value very delicious snack. 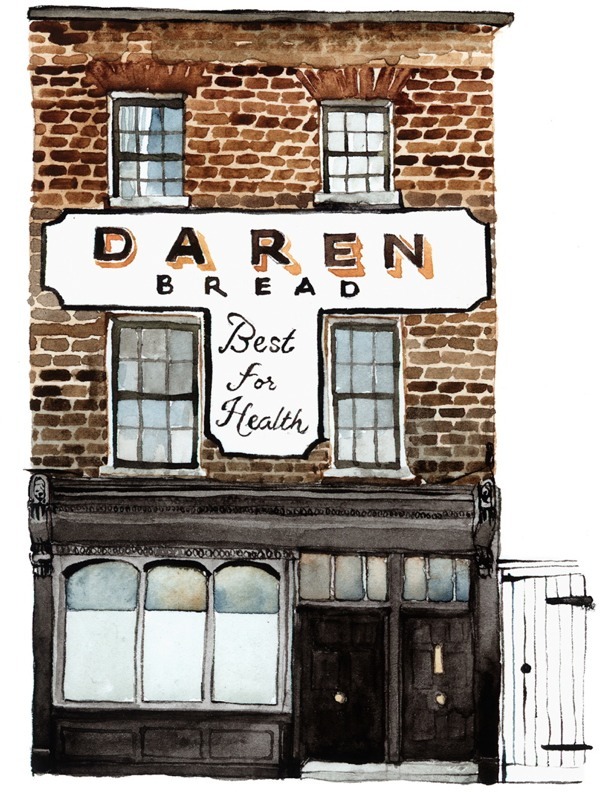 Daren Bread, however, got converted into a very beautiful home at least 10 years ago. Can’t remember exactly when, but there were pieces on it in the national media. These are just amazing! I love them all and as I do Freeform machine stitched art they have inspired me too. Now I’m jealous. 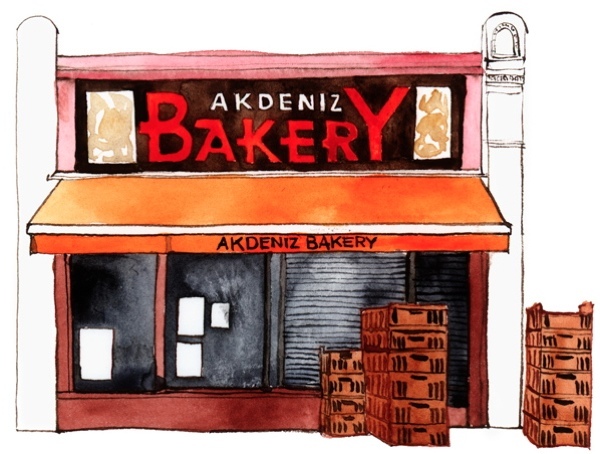 It’s a 20 minute car ride to our nearest authentic baker – five miles one way (through traffic) and ten miles the other way. Let’s hope the locals value these institutions shown here so that they have many more years ahead of them. I’ll be visiting at least one of them on my next visit! 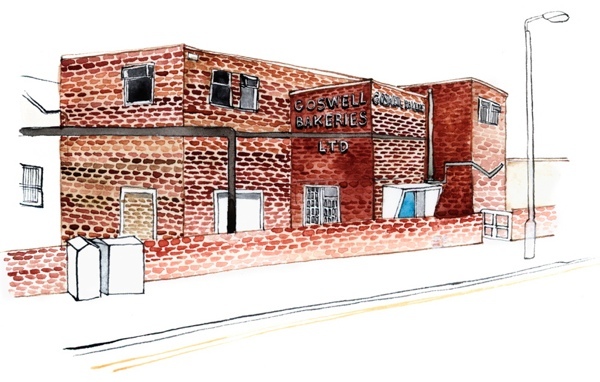 Beautiful drawings, and a historic record for the future. I attended one of your Masterclasses in February, and found it a very fulfilling and rewarding experience. 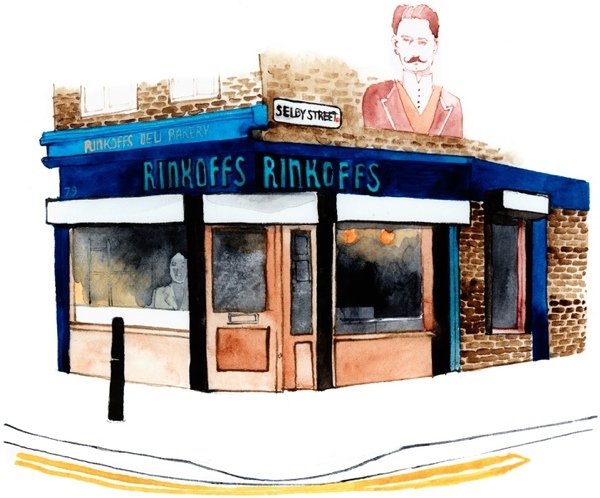 I have been following Spitalfields Life since then, and, as usual, your posts are vivid and interesting. Raabs for me every time. Save for the jam, their doughnuts knock those from the much-vaunted St John Bakery into a cocked hat every time. And you can around three for the same price as St John! 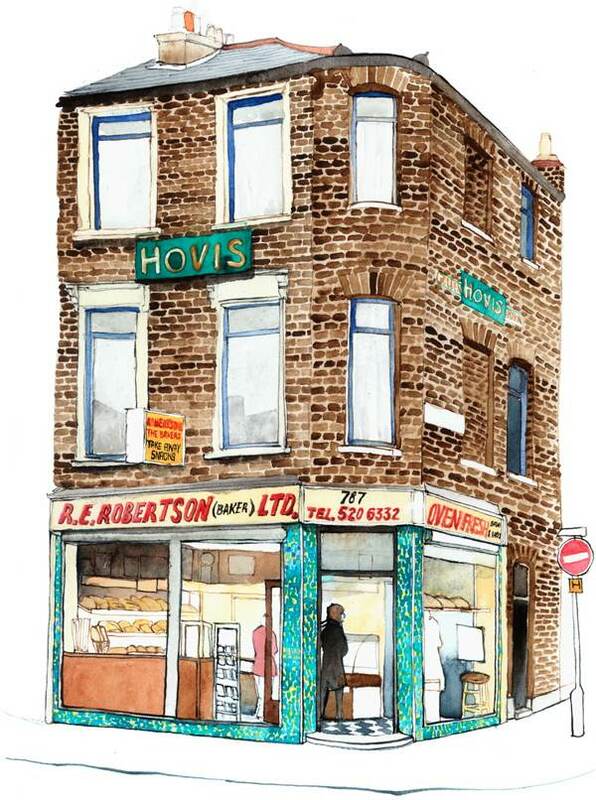 Their ‘lost’ bakery (Star) on Dalston Lane sustained me with doughnuts in the days after my first baby came along. Not very healthy granted, but so good. Wonderful watercolours, done with great skill and feeling for the area. Want some bread!!! I agree with Ruth – Raabs every time for me. 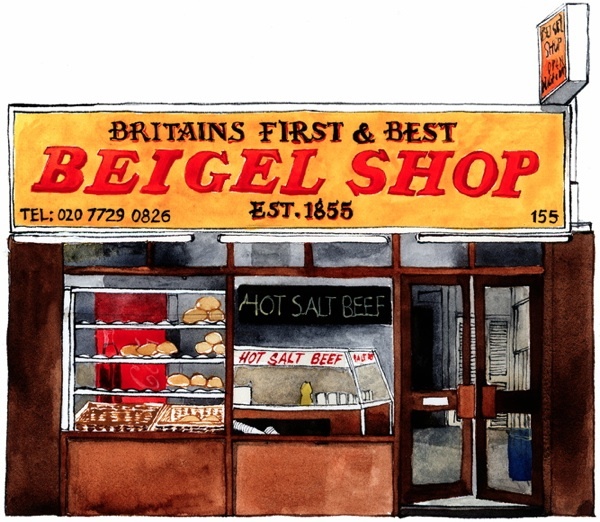 Tony and I were devastated when their ‘Star’ branch in Dalston Lane closed – but we continued to drive to the Essex Road every Saturday for bread and donuts. 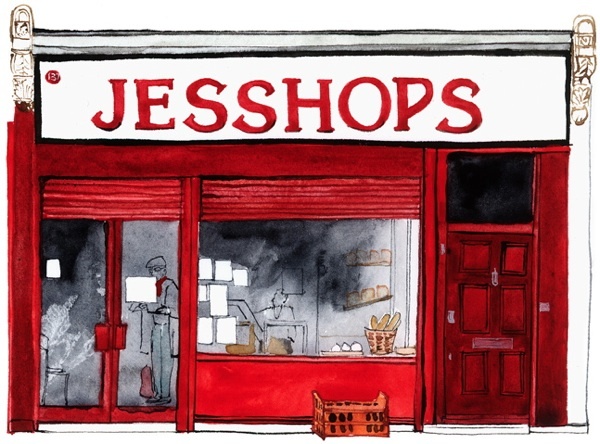 There’s always a lovely friendly atmosphere in the shop. I loved your website. 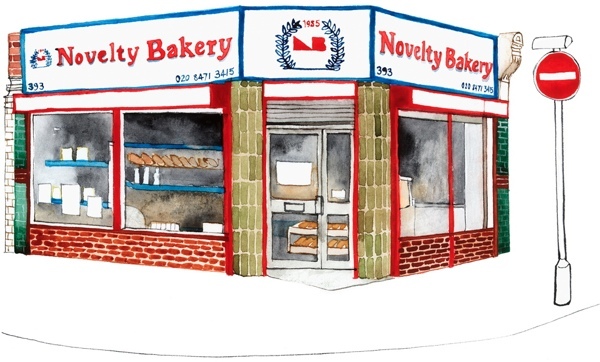 I was going through it and came across the bakery at Newington Green. 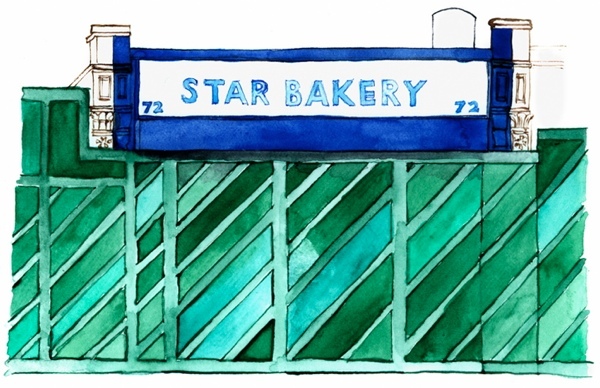 This was the bakery that my mother ordered my “American Wedding Cake” back in 1958 when I married my wonderful husband who was stationed in England with the U.S. Air Force. We met in 1956 and were married in 1958. He passed away in 1990 but we had five wonderful children and I have never regretted a day with him. I have since remarried but I will never forget that cake – it was gorgeous, three tiers with lovely whipped cream and wonderful cherry brandy in it. It was absolutely delicious. It made for a very memorable wedding reception. You can tell it was a hit because I tried to replicate a smaller version for my second wedding – almost as good, but not quite. I believe the owners were German. Also the dinner rolls and pastries were a big hit. 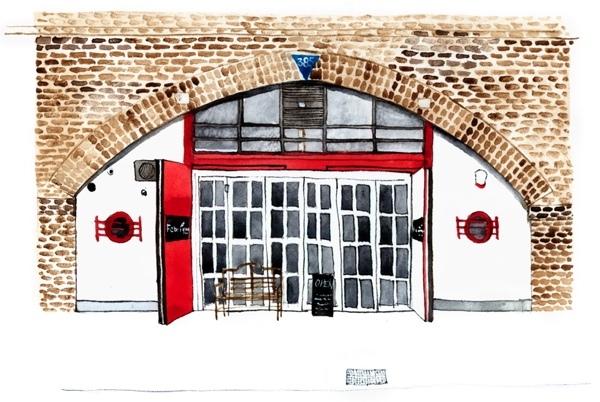 These sketches are incredible and bring baxck many happy memories of my days in the police around the East End of Town.